Some environmental threats are subtler than others. Pesticides, traffic pollution, or urban waste are some of the ecological concerns of which people are generally aware, albeit with different degrees of concern. Yet, some hazards for plant, animal, and human life are less known by the general audience but are nonetheless worthy of attention. 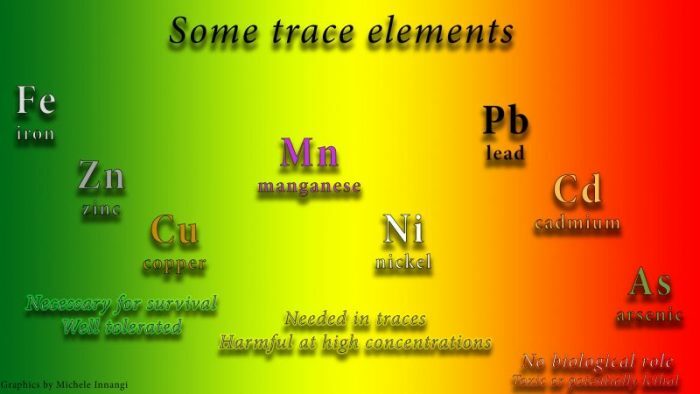 Trace elements are one of these more obscure threats to the environment (Figure 1). We are talking about atoms which are naturally occurring in our world, although generally in lower concentrations compared to most elements. These elements include some of those who were formerly known as “heavy metals” due to their high density and/or atomic weight. Although some trace elements are needed for the survival of most plant and animal life and are generally well tolerated (e.g. zinc, copper, or iron), others are needed in much smaller quantities (e.g. manganese or nickel). On the contrary, some trace elements do not have any known biological functions in most life forms and are very dangerous even in small quantities. We are talking of elements such as cadmium, lead, or arsenic. Some of these harmful elements tend to accumulate into organisms as they age, becoming a subtle and silent cause of illness or death that goes undetected until it is too late. When bound to organic molecules, elements such as mercury can even increase along the food web in a pattern known as biomagnification, which may lead to severe contamination in predatory animals like tuna or dolphins. Human activities have undoubtedly increased the availability of these toxic elements in the environment, and the aforementioned pesticides, traffic pollution, and urban waste can be also a source of trace elements, along with industrial activities. How can humans cope with this subtle threats? The first thing that is needed is a rapid and fast way to assess the levels of these pollutants in the environment, and this is usually achieved by using biomonitors. Biomonitors are plants, animals, or fungi that can be used as an indicator of contamination by one or more of these trace elements. Some of these organisms might tolerate high levels of trace elements and might thrive in polluted environments where most plants or animals die, while other biomonitors are extremely sensitive and might readily disappear when the environment is polluted by a toxic element, promptly indicating such pollution. As a more generic tool to evaluate trace elements in the environment, scientists have often given their attention to birds. Birds are often very easy to identify and collect, some species are largely ubiquitous and many live alongside humans. As a tool to harmlessly monitor trace elements concentration into birds, feathers are a perfect means. Flight feathers can be collected from birds without any harm to them and their trace element contents correlate with those in muscles, indicating long-term patterns of pollution. In a paper recently published in Science of the Total Environment, a research led by a team of researchers from the University of Campania “Luigi Vanvitelli” and ARDEA (Association for Environmental Research, Dissemination and Education), with the support of the University of Naples “Federico II”, used feathers from an endemic sparrow species (Italian sparrow, Passer italiae) to evaluate the concentration of 11 trace elements. The survey was done in an agricultural area in southern Italy (WWF Reserve “Lago di Conza della Campania”) where there is a patchwork of natural environments, urbanized areas, and industrial facilities. During yearly bird-ringing surveys with professional ornithologists, a large number of birds (184 specimens) was captured, in a time-span of three years (2014-2016) and considering juveniles (birds born in that breeding season without any moult in progress), moulting (birds born in that breeding season but with active moult) and adults (birds at least one-year-old at ringing). The results showed an outstanding increase in concentrations from elements such as arsenic, chromium, and cadmium from juveniles to adult birds (Figure 2). Arsenic, in detail, was five times more concentrated in adults than juveniles in a pattern known as bioaccumulation, while other elements (such as zinc and copper) remained at similar concentration through age classes. Such a detailed survey also showed that the concentrations of some of these trace elements can be rather variable across years while others, such as aluminum, were fairly stable during the three years of the survey. Yet, the most interesting result from this research was that, regardless of the effect of age class and sampling years, the elements which were clearly affecting bird health in a negative way were cadmium and barium (Figure 3). Whereas the former is largely known as toxic and dangerous to reproductive organs, kidneys, and egg formation, the latter is less known and studied. Given their similarity in chemistry, barium atoms can often replace calcium ones in bird biology, such as entering the keratin present in bird feathers. There is not a large amount of data on the origin of barium pollution, but dust originating from traffic pollution can be a relevant source, and high levels of barium have been associated with deformities in bird embryos. 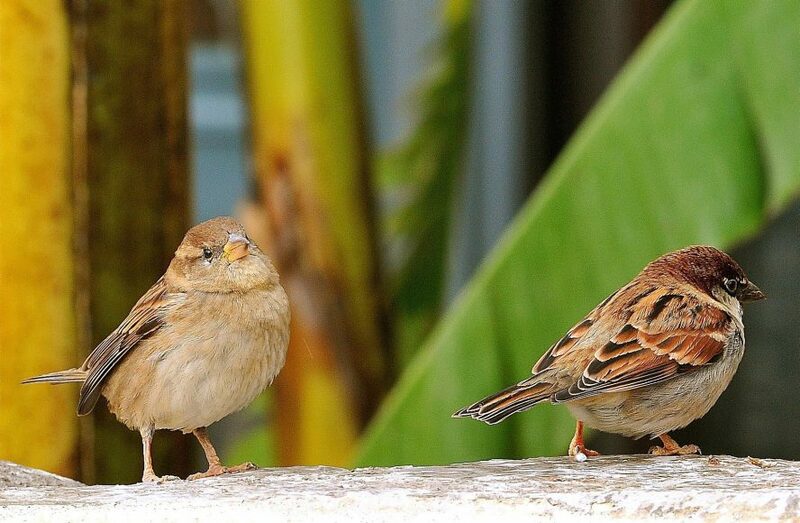 In Italian sparrows, an inverse trend was found between barium and body condition, suggesting that, even if in non-alarming concentrations, birds that have plumage with a higher concentration of Ba in their keratin might manifest a lower health status. 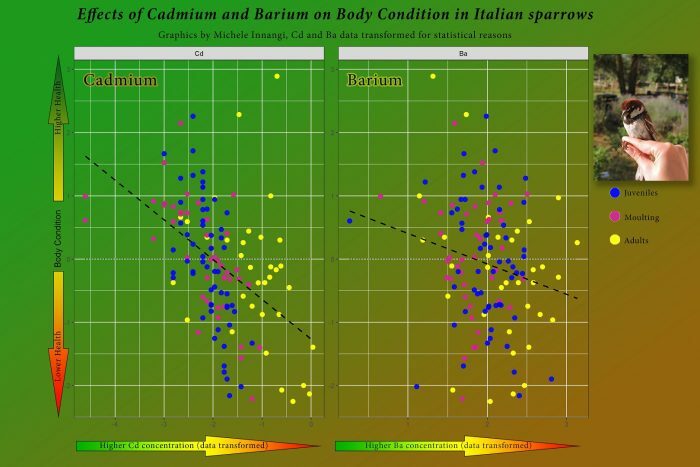 Thus, Italian sparrows can be a relevant biomonitor for cadmium and barium concentrations in the environment, regardless of their age and the year when they are sampled. Such research is timely and important and might open new perspectives in understanding how these elements affect bird health and fitness and, eventually, help us prevent and amend potential sources of contamination that can eventually affect humans as well. 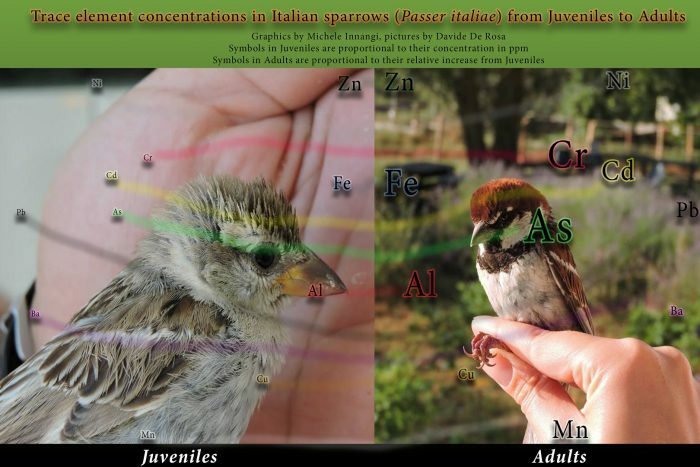 These findings are described in the article entitled Analysis of 11 trace elements in flight feathers of Italian sparrows in southern Italy: A study of bioaccumulation through age classes, variability in three years of sampling, and relations with body condition, recently published in the journal Science of the Total Environment. This work was conducted by Michele Innangi from the University of Campania Luigi Vanvitelli and the Associazione per la Ricerca, la Divulgazione e l’Educazione Ambientale, Davide De Rosa, Ilaria Fozzi, Marcello Giannotti, and Marilena Izzo from the Associazione per la Ricerca, la Divulgazione e l’Educazione Ambientale, Tiziana Danise and Antonietta Fioretto from the University of Campania Luigi Vanvitelli, and Marco Trifuoggi from the University of Naples Federico II. Michele is a research scientist at the Università degli Studi della Campania "Luigi Vanvitelli, Department of Environmental, Biological and Pharmaceutical Sciences and Technologies. Davide is a research scientist at the Associazione per la Ricerca, la Divulgazione e l'Educazione Ambientale.